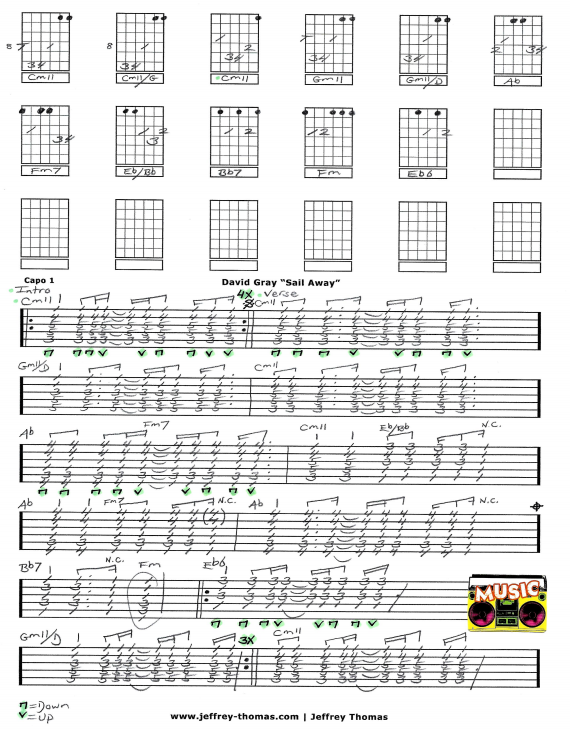 David Gray Sail Away Guitar Tab by Jeffrey Thomas. Here is a custom acoustic guitar tab for this chill tune by David Gray. I followed the studio recording and also watched some live videos to decide on the chord voicings I would use. Learn the proper song structure, strumming details and rhythm so you will sound great. Want the full guitar tab for free? Go ahead and send your email through the form provided and I will sent my full arrangement. Try a free Skype guitar lesson today! Just fill out the Schedule A Free Lesson form and we will set up your lesson! Did you know “Sail Away” is often played on the Expedia phone service while on hold, due to its message of escape. Find more popular acoustic guitar tabs on my tab, blog and video pages.